An incredibly complex disease, anxiety has an interwoven variety of biological, psychological, and sociological contributing factors. From a variety of angles, we discuss 11 ways meditation is the very best way to once and for all, become anxiety free. How Mindful Meditation Tames The Anxiety-Ridden "Monkey Mind"
What Is The "Monkey Mind"? It has been said that the human mind is like a room full of drunk monkeys — jumping around, chattering endlessly, carrying on all day and all night. Of the dozens of monkeys clamoring for our attention, the loudest, most powerful voice is their highly influential troop leader — fear. The fear monkey pulls the alarm constantly, points out every single pothole in our path, makes up an infinite number of "what-if scenarios," while ensuring anxious thoughts always stay at the forefront of our mind. Can We Fight Or Banish The Monkeys? The problem is, the monkeys are built into the very fabric of consciousness, they are of the essence and nature of the mind. Like the elements, they have always been there and always will. We cannot banish them from our mind anymore than we can rid carbon or hydrogen from the earth. Fighting them makes about as much sense as diving headfirst into a sidewalk to cure a cold, or roundhouse kicking a brick wall to eliminate athlete’s foot. The mind monkeys are part of you, they are part of us all. Simple yet elegant, there is but one solution... They need to be tamed. Practicing mindful meditation teaches you to pay attention to your chattering monkeys, to know them, to listen to them, to understand them. With each session, you become more familiar with how they behave, their habits, their good sides, their bad sides, their triggers, their quirks, what makes them tick. Like an expert animal trainer, meditation’s face to face interaction with the monkeys will, in time, build a mutually beneficial, trusting relationship. Once you become their master, they learn to be docile, gentle, and submissive. With enough time, mindful meditation can even make them benevolent, kind, and peaceful. Taming the mind will make you an infinitely calmer, much happier person, free from the wild shenanigans of fear, worry, and anxiety. Is focusing our attention on natural disasters, war, terrorism, crime, incompetence, scandals, and corruption a function of our biology or did we get here through conditioning? Is it nature or nurture? While there are no guarantees in life, too much activity within your primitive "fear center" amygdala 100% certifies a lifetime supply of anxiety. The first stop on the mindful "highway to happiness" will quickly dump your truck-load of anxiety, no matter how full. We are living in stressful times. The mounting career, relationship, and family commitments we face makes living in this chaotic, fast-paced world all the more difficult. Pile on always connected modern technology, and only an absolute master can truly switch his mind off from the stress of worldly pressures and demands. In a 2010 American Psychological Association survey, 75% of Americans reported that their stress levels were so high that they felt unhealthy. But, stress is all in your head, right? How could it possibly harm your health, as these surveyed people claim? That’s correct, if the effects of stress were purely in the mind then it would be no big deal. The problem is, evolution has hard-wired our DNA to physiologically react in stressful situations — our heart races, our breathing becomes shallow, our blood vessels clinch up, our pupils dilate, our muscles tighten, all in preparation to either fight or flee. The good news is that your body has a built in stress-defense mechanism — it's called the parasympathetic nervous system. Your ability to stay anxiety-free is directly tied to activating this often elusive system each and every day. Then, what’s the best way to wake up this sleeping giant? Meditation. Meditation Controls Anxiety Through The "Mind-Body Connection"
In the 1970’s, Harvard University physician Herbert Benson observed that well over half of his patient visits were because of stress related disorders, like anxiety. He thought, if he could figure out a way to counteract this phenomenon, it could revolutionize the healthcare industry, helping untold numbers of people. He accomplished his mission. In essence, what Dr. Benson discovered was the true power of the meditative mind-body connection — slower metabolism, measured breath rate, reduced heart rate, and quiet brainwave activity all combined to make the perfect state for healing. 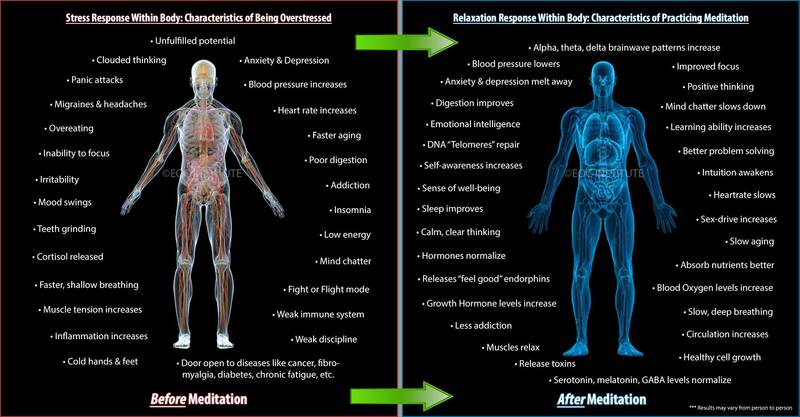 Meditation Reverses Anxiety Through The "Relaxation Response"
By using meditation to simultaneously activate the parasympathetic nervous system while deactivating the body’s "fight or flight" stress mode, his patients reversed countless health issues, with anxiety often the first domino to fall. Dr. Benson’s bestselling book, "Relaxation Response," has sold millions of copies, providing great momentum to the mind-body movement, and stands as another solid example of hard science confirming age-old mindfulness wisdom. Between your magnificently complex brain's 100 billion neurons are a web-like network of information relayers known as "neurotransmitters." For the anxiety patient, there are two crucial "must know" neurotransmitters: gamma-aminobutyric acid (GABA) & serotonin. When levels of these two key brain chemicals run on empty, our stress defense shield drops — making us vulnerable to anxiety and all of its ugly, inbred cousins: worry, restlessness, nervousness, insomnia, etc. If you are taking anti-anxiety medication, it is very likely targeting these two chemical messengers. Then, why not just pop a pill to make it all better? The problems with anxiety and depression medication are many, including feeling like a zoned out "zombie," dependency, dizziness, drowsiness, poor concentration, memory loss, confusion, headache, blurred vision, insomnia, weight gain, fatigue, nausea, the list goes on. The cherry on top, clinical studies have shown some of these to be no more effective than a placebo, or even not working at all! Luckily, an all natural, much better solution exists. Backed by a mountain of research and centuries of anecdotal evidence, meditation drops anxiety harder than a ton of bricks. So, what’s the data? For serotonin, as evidenced by a highly cited University of Montreal study as well as many others, it is well understood that meditation boosts this prime neurotransmitter to "anxiety resistant" levels. GABA and meditation are also well-linked. One study by psychiatrists at the Boston University School of Medicine found an incredible 27% increase after less than one hour of meditation! Strengthening the case, researchers believe that practicing mindfulness has a very strong neurotransmitter "cumulative effect," with tectonic implications for the anxiety sufferer. To illustrate how it works, what would happen if you put $15 of gasoline into your tank each morning, while using only $10 worth on your daily commute? Of course, your tank would eventually get full and stay full, basic supply and demand economics. For your brain, meditation does the same, fillin' 'er up with the most purely refined GABA & Serotonin, replenishing far more high quality octane than stress can ever deplete. When your tank is always full of these naturally calming, feel-good neurotransmitters, you become immune to the mileage (anxiety, depression, addiction, etc) which would otherwise have you on the side of the road calling for a AAA tow-truck. Would you rather pop a side-effect ridden pill to feel calm and happy for a little while? Or fundamentally upgrade your biology to be forever "anxiety immune"? Tough call. Meditation Extinguishes The Body's Anxiety Inflamed "Wildfire"